Today’s guest post is from Mark Ward. 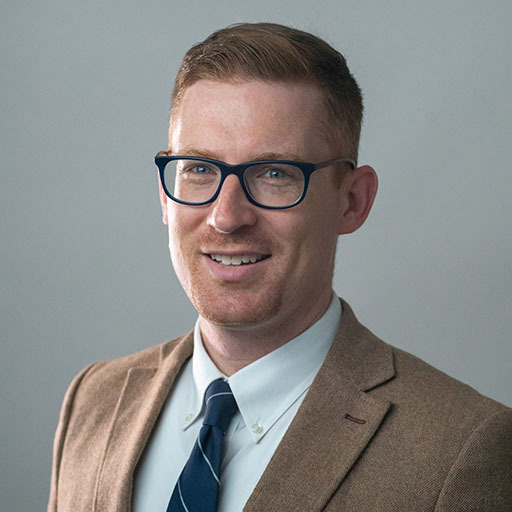 Mark received his PhD from Bob Jones University in 2012; he now serves the Church as an Academic Editor at Lexham Press, the publishing imprint at Faithlife, makers of Logos Bible Software. He has written hundreds of articles for the Logos blog, and his most recent book is Authorized: The Use and Misuse of the King James Bible, a book “highly recommended” by D.A. Carson. But I humbly suggest that believing textual critics ought to keep insisting to the church, for the good of the church, that most of their work is a tempest in a rather small teapot—and not the one Mother sets out when company comes over. Precisely because of my love for it, and after following it all these many years, and while acknowledging that textual criticism has chronological priority in exegesis, I insist that ETC is the etc. of biblical studies. It is the tithe on mint, dill, and cumin. No, probably just the cumin. And I have built a textual criticism teaching tool that, I hope, will help everyone see just how inconsequential the vast majority of textual decisions are: KJVParallelBible.org. 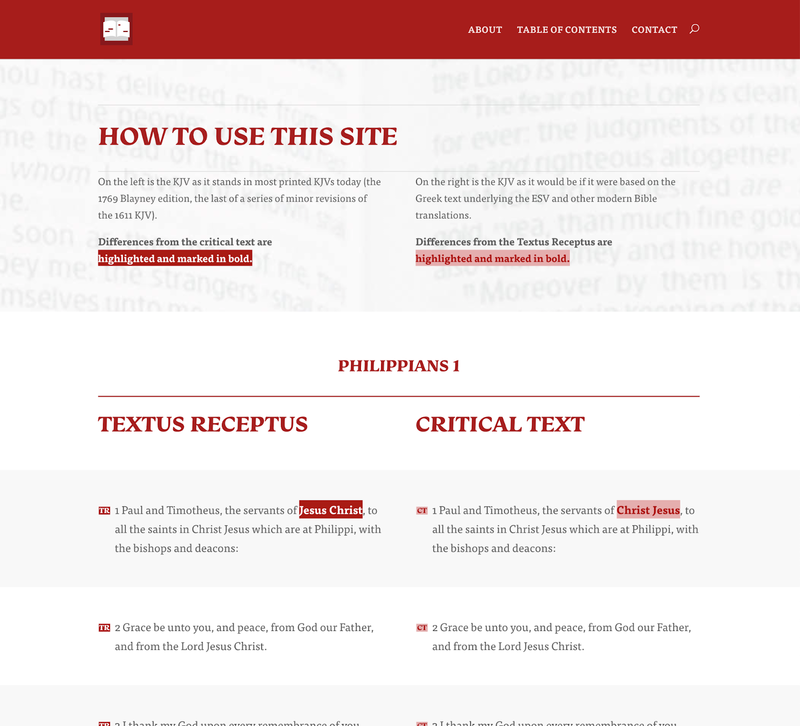 After two years of labor, and helped along by numerous skilled volunteers, the site launches with the complete New Testament (plus study tools!) today. 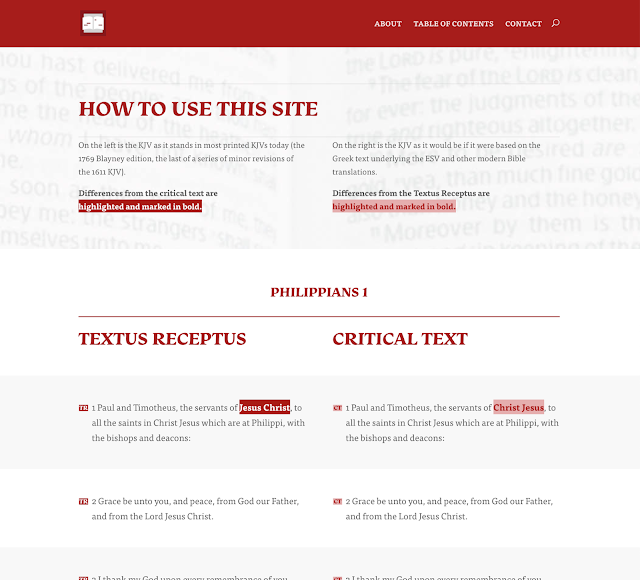 The site dedicates one page to each of the 260 chapters of the New Testament. On each of these pages are two columns. The left column is the KJV as it stands in the common 1769 Blayney edition. The right is the KJV as it would be if Peter Williams and Dirk Jongkind could travel back in time and hand the KJV translators an NA28—instead of the mixture of Stephanus (1550) and Beza (1598) the translators in fact employed. (In this imaginary scenario, I am asking them to hand over an NA28 rather than a THGNT—sorry.) The differences between the two KJVs are then highlighted. The result is a cheat sheet, in English, of all the translatable differences between the two most important printed GNTs in existence—their importance in this case being judged by one criterion: the TR and the NA are the only two texts major English translations have seen fit to translate. If a layperson walks into a Christian bookstore looking for a Bible, he or she is unlikely to know or care about the textual basis of its New Testament. But he or she will still necessarily choose one of these two major options, basically Scrivener or Nestle-Aland. So though many other angles on textual criticism are useful—the theoretical, the exhaustive, the theological—KJVParallelBible.org provides the most practical. Until now, it has been impossible for someone for whom Greek is all Greek to have anything like a firsthand grasp of the differences between the Majority-based TR and the eclectic critical text (CT). Such people have little to no way of knowing whether the NKJV and NIV differ in a given place because of text or because of translation philosophy. And in this darkness, conspiracy theories have grown like mold. Indeed, KJVParallelBible.org arose out of a personal calling I have to appeal to my brothers and sisters within KJV-Onlyism. My main work so far—a book and a documentary—has actually avoided textual criticism and focused on English, because I think NT textual criticism is too difficult a topic for most people to form a careful, firsthand opinion about. Nonetheless, KJV-Only Christians who have responded to my work persuaded me that there had to be something I could do to make the work of textual criticism more accessible. And, in the process, I found that the site makes a great teaching tool for New Testament Introduction classes and even full-on textual criticism courses. Now, I mean no offense and no discouragement to all my beloved ETC contributors when I compare their work to a seed small enough to get caught in one’s teeth. And I remember Jesus’ words: tithing on cumin is something which “ought not to be left undone.” Explaining to the church why there are textual footnotes in their Bibles is a necessary and perennial work. And on those days when someone such as Bart Ehrman upsets the TC teapot and the contents come spilling into very public view, I thank God especially for ETC. But our argument against Ehrman is very commonly that he is making a mountain out of … a cumin seed. So how can we teach students about the complicated topic of NT textual criticism while keeping it in proper perspective? By giving students of the Bible the visual lessons implicit in KJVParallelBible.org. And here are a few of the lessons—in fact, three (a number I arrived at through combining new CBGM techniques with Hebrew gematria via a formula only I know, and that there’s no way Peter Gurry would ever be able to understand). I’ll start with the most important lesson—and the most obvious. 1. What’s really remarkable about Scrivener’s TR and the modern critical Greek text is not how different they are, but how similar they are. Standard critical editions of the Greek New Testament are awash in sigla, like pieces of cumin scattered all over each spread. Such editions also feature fat and complicated apparatuses on nearly every page. The visual emphasis (and this is heightened when one is informed that the apparatuses are not even exhaustive!) lies on the differences among NT manuscripts. But when I first designed and built KJVParallelBible.org and did some test chapters, something jumped out at me immediately. The overwhelming impression one gets upon viewing the TR and CT in parallel is the magnitude not of the differences but of the similarities. And isn’t this precisely the message those of us interested in NT textual criticism need to send to students and churchgoers? Variants exist between the two major textual traditions, yes, but they pale in comparison to the similarities. There is no cause for doctrinal alarm. Verse after verse in the two texts is precisely the same. Sometimes whole chapters are. And even the variants that show up are frequently so minor that I feel grieved to the heart to know that Christians fight over these things, or (worse) lose their faith over them. Textual criticism is one of those fields in which statistics can be both genuine facts and damned lies (and I use that word advisedly!) at the same time. The variants between manuscripts do amount to something huge, numerically, this is true—and that is understandably scary to anyone who believes that the Bible is the inspired word of God. But I must condemn it as a lie if it is used to insinuate that there are numerous meaningful, viable, doctrinal differences between the major printed Greek texts. 2. English makes certain patterns in the variants more visible. “Insufficient sampling” is a common temptation in textual criticism. Both scholars and laypersons can form judgments based on very slim selections of the data. And, truth be known, given the state of original languages education, the number of people who can read Koine Greek with anything close to fluency and rapidity is vanishingly small. It’s so laborious to take in textual critical data, even when you “know” Greek, that it’s hard to go quickly enough to get a big sampling to chew on. Most people can’t “skim” Koine. But they can skim English. I myself felt I’d entered a new world as I worked through more and more chapters of the NT on KJVParallelBible.org. Suddenly I could take big bites of the data at once. Whereas (metaphor change alert) I had previously dug deep into individual textual-critical problems, now I could fly over bunches of variants at, say, drone level. Suddenly I noticed patterns that I don’t think I could have seen in any other way. A. “Jesus Christ” and “Christ Jesus” are a common variant pair. I knew this on a theoretical level: I’d read it as a postulate in various discussions of textual criticism. But to see it over and over and over is to sense that there had to be some kind of rhyme and reason, some kind of program or purpose. My suggestion: use KJVParallelBible.org to find possible patterns in the variants, and then do your digging in the Greek. Other patterns you’ll notice but can confirm with more study. For example, “Christ” is often present in the TR and not in the CT (40 times, it turns out). The same goes for “Jesus” (58 times, I find). These features of NT textual criticism have been discussed many times, but there is something valuable about letting them bubble up from inductive examination rather than having them taught to you by a textbook. B. I’ll put this on the hypothesis level—I’m not ready to conclude anything yet; but Revelation appears to me to be worse, textually, than other books. 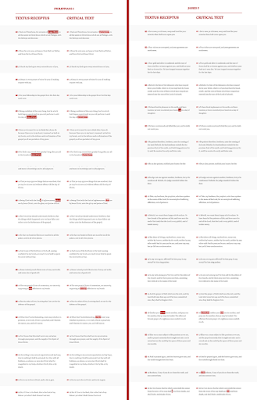 I uploaded Revelation last, and after looking at 238 other chapters in the NT, Revelation’s number of variants jumped out at me visually. (I still think the similarities jump out more than the differences, but the jump in the latter seemed noticeable.) Even if my hypothesis turns out to be wrong, I found it in the best way: through a sufficient inductive sampling of data. And now I can test it. C. The TR is not so much “longer” as “easier” or “smoother” and therefore longer. A staple argument of KJV-Only apologists is that the critical text “omits” certain statements. This, of course, presumes that the TR didn’t “add” them. And I came away from looking at all the data more convinced that the critical text explanation makes the most sense: it seems far easier to me to explain the longer text in the TR as smoothings than it is to explain why scribes would purposefully or accidentally omit words that cause interpretive difficulties. It’s kind of like the apocryphal additions to Esther—it’s easy to see why moral questions raised by the story (why didn’t Mordecai bow to Haman, and why did Esther willingly spend a night with a pagan king?) would occasion these additions. 3. The same thing can be said with different words. It’s one thing to say, “The variants between the TR and CT amount to an entire page/chapter/what-have-you.” That’s alarming for any evangelical worth his Mark 9:49. It’s another thing to actually look at these variants in context. People quickly forget how many statements in the NT are not remotely doctrinal, and—and I say this as an unabashed inerrantist—they overestimate the contribution of individual words to the meaning of sentences. Yes, it feels wrong to say that a perfect book can be changed without its meaning being changed, but it’s really true. 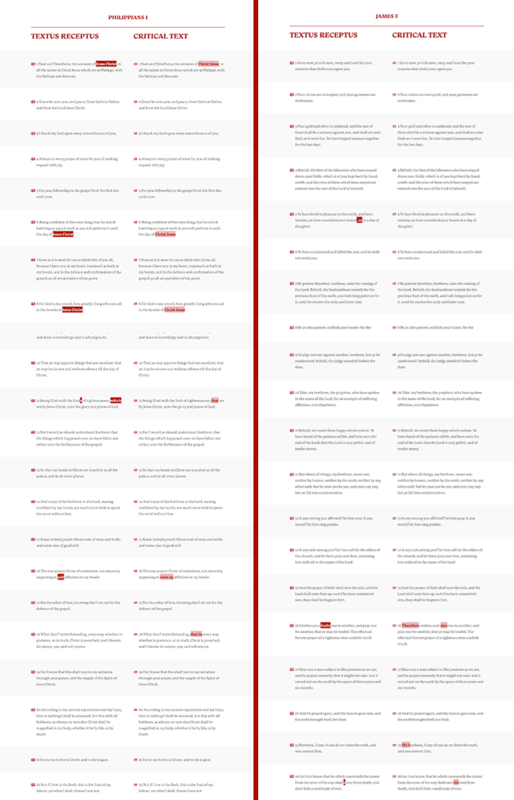 There were many times while building this site when I tried my very best to discern a difference in meaning presented by a given set of variants, and I just couldn’t come up with anything. God’s voice in Scripture is strong: he can speak over the bits of static created by minor textual variants. Of course, I don’t want to be in the business of figuring out how many variants can be introduced before doctrine changes, but I’ll observe that the Holy Spirit has already entered that business. The reason I can’t bring myself to believe that there is a “doctrine of perfect preservation” is both that it misinterprets various Scripture passages and that every jot and tittle is every jot and tittle. Unless we not only have every last stroke of the pen but have perfect confidence in which strokes belong and which don’t (even if one prefers the TR, what does he do with its variants? ), God has not given us a world in which the Bible has been perfectly preserved. That is the standard Jesus sets up in Matthew 5:18—if indeed his words are talking about preservation at all, and not efficacy. Naturally, I take the latter view. The Spirit gave us a remarkably but not perfectly pure NT textual stream. I choose to be thankful rather than to demand better. Of course, there is plenty of expert discussion on textual criticism, some of which has been made very accessible (including, notably, on the ETC blog). But TC is a necessarily inductive discipline—you cannot form an accurate impression of the variants out there without exposure to a great many of them. We do have excellent textual commentaries—Metzger/Omanson, Comfort, even Brannan and Loken’s Lexham Textual Notes, which covers the entire Bible and includes no Hebrew or Greek. But these, too, “leave out” data I have come to see as extremely important, particularly (but not only) for laypersons: they do not show English readers how many words in Scripture are precisely the same across major GNTs. After two years of work on KJVParallelBible.org, I have come to believe that a firm grounding in the differences and the similarities, inductively gathered, is the best defense against the unhealthy skepticisms of both Ehrman on the left and Ruckman on the right. KJVParallelBible.org is a teaching tool, a quick-reference cheat sheet, and (I pray) a resource to bring light to the church. I end the project grateful to the Lord for his word and its preservation. I have now made my personal tithe on cumin and can move on to dill. This is wonderful! Mark, great job in helping TC be accessible. Even further, thank you for trying to give the only-ists a more nuanced view of translations. Excellent! "blessed are the peacemakers". Thank you for all the work you did in compiling and sorting. This side-by-side comparison is so very easy to use, and makes instantly clear how little the CT differs from the TR (and therefore, presumably, even less than from the Majority or Byzantine Text). The issue of being able to see at a glance, a large swath of scripture in comparison, seems to me, to be the greatest value. One TC website focuses on sections of chosen passages to give the appearance that the early manuscripts are corrupted in comparison to MT. Kudos, Mark. Matthew 16:8 has obviously been affected by parallelism to Mark 8:17. Take your pick; either the TR brought in αὐτοῖς or NA brought in ἔχετε. But I speak in a figure, as neither the editors of the TR or the editors of NA made any such move themselves. The TR's alleged urge to help the reader out doesn't come through in Revelation Chapter Six, where I count only two Stephanus expansions (a formulaic και βλεπε after every occurrence of ερχου, and πασ before ελευθεροσπασin v.15), as compared to four in the critical text ('seven' and 'with' in v.1, 'as it were' in v. 6, and 'whole' in v. 12). This is a great resource! Thank you so much! There is a very similar resource in print that I have recommended to people for a few years. I do not recommend the author or any of his other books, but I have found Jack Moorman's "8,000 Differences Between the N.T. Greek Words of the King James Bible and the Modern Versions" to be a useful resource. If I remember correctly (my copy is currently packed away somewhere), each 'opening' has two columns on each page. One is the TR (I don't remember which; maybe the Trinitarian Bible Society?) paired with the AV, and the facing page has the NA27 and an AV-styled translation that reflects the differences, if the differences make a difference in translation. It gives the same English text in both places for non-translatable differences, but it still gives the Greek to show what the differences are. I seem to remember it even includes differences like εστι/εστιν. That being said, having a resource like yours that is online is far more useful because of its accessibility. Thanks again! I suppose if one is only concerned with the differences between variants selected for inclusion in the base-texts of English translations, this has a use, as a tool for assuaging some concerns of apologetics-students. But whaddaya do at passages such as Mt 13:33 and Mt 27:49 and Mark 1:41 and Hebrews 2:9, and Jude 5, and Jude vv. 22-23, where things get a little complicated? Btw, the links in the Table of Contents are a little glitchy; all the chaoters in Matthew after Matthew 21 seems to be linked to Matthew 21. James, thanks for pointing out the issue on the TOC of Matthew. Those links should now be fixed. ...but when your first sentence contains an acronym that I've never heard of, despite a post grad qualification that includes years of Greek, then I'm afraid your English became Greek to me! Perhaps only second and later instances of acronym-worthy phrases should get abbreviated? Please? This a great tool to help us understand the vast similarity between variant texts and to help us help others to understand the small differences between Greek texts! No more lame excuses about the Bible's corruption.